Goat raising by Chuda Dhuarali is currently in full swing at Pine Island Farm. This addresses the extremely high demand for goat meat among the immigrant population in greater Burlington. Research during the design phase of the project indicated that the equivalent of some 3,000 goats were being imported frozen from Australia to the ethnic markets of Burlington and Winooski every year. Many consumers expressed a strong preference for fresh local meat and were traveling long distances around New England in search of live goats. When we conducted a blind taste test of imported frozen meat versus locally raised fresh meat (both having been prepared in the same way) with New Americans before starting the project, 36 people preferred the Vermont goat compared to 9 who expressed preference for the Australian meat, giving us confidence that this project would address a real community demand. Each goat raising operation acts as an individual farm enterprise. Each farmer owns and manages his herd but, as members of The Vermont Goat Collaborative, share barn space, pastures, and major farm equipment. At this time we have two goat raising operations at the farm. We are studying whether the barns and pastures can accommodate a third herd in future seasons. In the production model, Chuda obtains bucklings (young male goats) from goat dairy farm partners at several months old. He has partnered with several wonderful dairies, including Fat Toad, Blue Ledge, Twig, Sage, and Boston Post farms. This mutually beneficial arrangement allows us to obtain a stock of quality bucklings but also resolves a significant problem for the dairies who have no use for their young male goats. In 2014, the two herds at the farm totaled about 250 goats. In 2018, Chuda's herd was totaled almost 350. Approximately 90% are castrated male goats, though we do have some females that were surplus from the dairy farms. In the past, the two week old bucklings were raised on the farm for about eight weeks on goat milk replacer before being weaned and, if the weather permited, headed out to the spring pastures. Now we have a more efficient system for self feeding - and obtaining older goats helps everyone grow stronger! Pine Island goats enjoy frolicking on the farm’s bountiful fields adjacent to the Winooski River, returning to the barn each night so that the resident coyotes don’t enjoy a goat supper. We practice modified “mob grazing,” systematically moving the goats through the lower fields with portable solar fences. The goats graze intensively on small areas, which encourages the herd to eat and spread their manure evenly across the field. While different ethnic groups have particular preferences (e.g. the Bhutanese prefer younger castrated male goats, the Burmese favor older cull does, and many West Africans are partial to older intact male goats), there is a demand for all the goats that we can make available to the market. By acting as a middle-person between Vermont's goat raising farms and the New American consumers, Chuda helps these farms dispose of their animals in a humane, productive, and efficient way. Pine Island farm does not sell meat (in accordance with State regulations), but rather sells live goats. Once the buyer owns the goat, s/he is able to custom slaughter the animal as long as the meat is not sold and is used only for family consumption or shared with friends. For our New American buyers, being able to slaughter their own animals in a safe, clean, and State approved facility offers the opportunity to maintain their cultural traditions and pass them along to the next generation. The Pine Island Community Slaughter Room celebrates the role of ritual slaughter and the important role it plays in people’s lives. It is a welcoming place with flowers in the window boxes and a plexiglass door on the slaughter room so that family members can participate in the experience. Animals are treated with tender respect until their last moments. Our buyers practice Halal style slaughter. There is a modest fee to use the slaughter room, which covers utilities and supplies (such as food-safe plastic bags) required by State regulations. It is expected that clients using the slaughter room will be experienced in slaughter as well as skinning and preparing the meat. The selling farmers are willing to help with the actual slaughter if necessary to ensure that best humane practices are followed. We have a burning table for clients who prefer not to skin their animals but rather to remove the hair by burning. All potential clients should please note: Meat slaughtered at Pine Island may not be sold or enter commercial establishments. This is strictly regulated by the State. In response to requests from community members, Theogene Mahoro at Pine Island started a robust chicken program to raise and sell meat birds to our community. The chickens are sold live and buyers process them at the farm. Demand is high as these chickens meets the desire of New American consumers for tougher and more flavorful meat. Theogene's chickens are particularly suited to the stew and curry recipes that New Americans enjoy. He listens carefully to customer feedback and continues to research which breeds are best in our climate. Please note - Theogene can not accept spent layer hens, in accordance with Vermont State regulations. We opened a 7 acre community garden at the farm in the summer of 2015. It was hugely successful in its maiden season with about 50 New American families gardening on 1/8 acre plots and three families taking on larger (1/2 acre) operations. We also had special areas gardened by the Winooski schools and Howard Center clients. Growers tell us that the family sized plots allowed them to grow enough vegetables to keep their family supplied the entire year (most people freeze their produce to use over the winter). Many of the gardeners grew plants familiar from home, including African corn, greens, and eggplant, and a magnificent array of various hot pepper varieties. In the coming year we will work with the larger gardeners to improve their commercialization strategies. Pine Island Farm occupies a spectacular floodplain landscape with a mile of waterfront on the Winooski River. A few miles down, the river enters Lake Champlain. The farm was long cultivated with corn and hay; chemical fertilizers were typically applied during the spring flood season, putting the river and lake ecology at risk. As we steward the property, we are working to find alternative production strategies that will both nurture the land and provide quality feed for our goats. We are currently piloting Phase 1 of the Pine Island ecological restoration project. The pilot intervention seeks to convert about 10 acres of tired hayfields, many of which had been taken over by invasive Reed Canary Grass, into a more biodiverse browse ecology that both mimics the native species of the floodplain and provides nutritional forage for goats. We have been planning this intervention for a year with a multi-stakeholder group that includes a county forester, landscape ecologist, small ruminant specialists, and goat farmers. The objective was to develop a strategy that would be great for the land and its native animal/bird/reptile/insect populations, the soil, the river, the lake, and our goats and chickens. We first plowed three 10’ wide bands across Field 1 to open an area for planting and to “waken” the native weed seeds (goldenrod, milkweed, etc.). This was a 1-time tilling that will not be repeated. 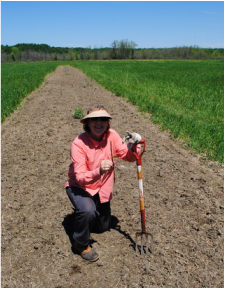 Then, with a hardy group of volunteers on a beautiful early summer morning, we planted the bands with a wide variety of willow stakes, red osier dogwood cuttings, and silver maple seedlings. We also planted birdsfoot trefoil, a nitrogen fixing plant. These bands will not be grazed until the plants are well established at which point they will be integrated into the lower field grazing plan. We hope that by keeping the Reed Canary Grass closely grazed (and clipped if necessary), we will encourage a “positive invasion” of plants from the new willow bands into the former RCG monoculture. Over time we would like to see the whole field evolve into a woody, weedy grazing area where goats can enjoy a wide range of plants that meet their nutritional needs and cater to their curious spirits and opportunistic eating preferences. This would provide diverse perennial browse with the added benefits of not requiring chemical fertilization and increasing the absorption of water onto the flood plain. If the results of this initial experiment look promising, we will expand the ecological restoration work to other fields in the Fall and continue to add diverse multi-story woody species (e.g. box elder, grapes, brambles, etc.) We are also working collaboratively with the Vermont Land Trust to expand and widen buffers along the Winooski River to reduce the run-off of pollutants.